A 26 km long 4-lane motorway, the M51, is being built to link Kliplev and Sønderborg in southern Jutland, around 15 km away from the border between Denmark and Germany. This PPP project also involves the building of 72 bridges and crossings – 11 overbridges, 30 underbridges and 31 smaller culverts. 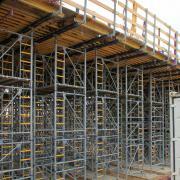 Only Doka formwork is being used for all the concreting works – e.g. 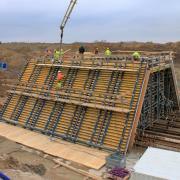 9000 m² of the extremely adaptable Large-area formwork Top 50, and more than 4750 basic frames of the heavy-duty Load-bearing tower Staxo 100 system. Unlike with a conventional tender, in a PPP project such as this one (Denmark’s first ever in connection with a road-building project), a larger share of the project responsibility and risk is placed on the private partner, in this case Kliplev Motorway Group A/S. The operator is responsible not only for building the project but also for planning, operating and financing it. This approach aims to encourage the private company to think in terms of optimised overall economic efficiency, as it is then in this company’s interest to consider the entire lifecycle of the project. KMG’s partner firms brought their expert knowledge to bear on this project right from the tendering phase, so as to carry out the works with carefully chosen construction technologies and methods that will greatly reduce the project’s life-cycle costs not only during the 26-year term of the concession but also for decades thereafter. This was one reason why most of the bridges are based on a straightforward frame-bridge concept with the aim of obtaining a statically advantageous structural design. Bridges of this type have only a minimum of accoutrements in terms of e.g. joints, bearings and drainage pipes. All in all, the technologies chosen by KMG are expected to lower the life-cycle costs by more than 40 % compared to a typical Danish motorway. The assignment may sound relatively simple at one level – constructing 72 bridges, 10 of them conventionally reinforced and 11 of them pre-stressed frame constructions – yet the differing geometrical and construction-engineering requirements make careful implementation quite a challenge. On top of this, there are the tight deadlines, which have to be met without fail. This all calls for thorough and conscientious formwork planning that takes account of all boundary conditions. 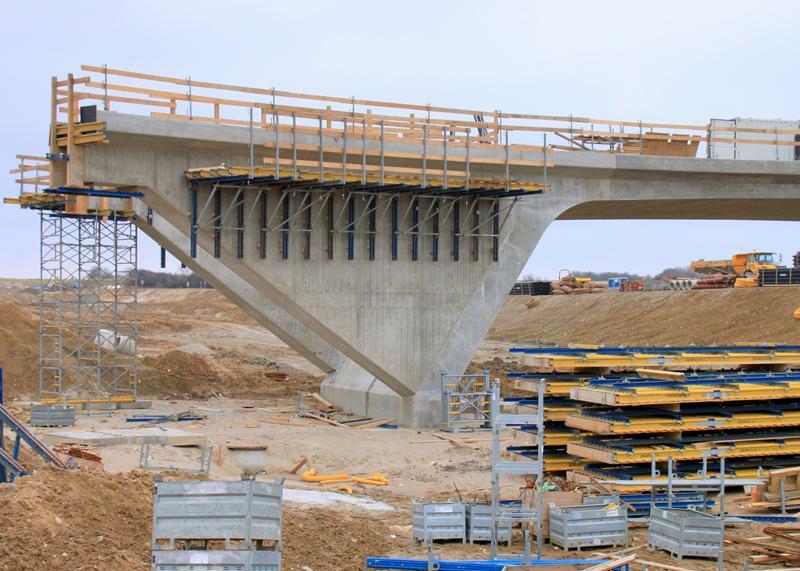 As early as in the planning phase, the project engineers at the formwork manufacturer’s Nuremberg Branch drew up an ingenious formwork and service concept for cost-efficient series production of these CIP concrete bridge structures. 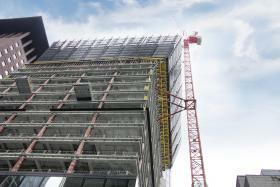 Ultimately, Dywidag Bau GmbH Nürnberg awarded the entire formwork contract to Doka. “For us it’s important to have just one point of contact for everything to do with formwork, so as to avoid any interfacing problems”, stresses Project Superintendent Torben Brokop. Around 725 m² of Framed formwork Framax Xlife had to be transported to the site in Denmark for forming the foundations and smaller culverts. At the same time, work began in the Doka Ready-to-Use Service in Germany on assembling over 9000 m² of Large-area formwork Top 50, while Doka Logistics arranged 26 truckloads of Load-bearing tower Staxo 100. 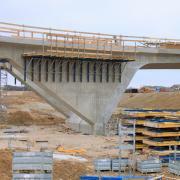 The conventionally reinforced bridge structures are being cast in section lengths of approx. 13 m, with their up to 70 cm thick carriageway decks being shored by the extra-high-capacity Load-bearing tower Staxo 100. The bottom of the inside formwork closes onto a 20 cm high springer which makes it possible to lower the entire inside formwork by 10 cm. Thanks to this generous stripping relief, it takes only 6 men less than 20 hours to winch the whole approx. 350 m² unit into the next section, on sheet-wall profiles that slide inside each other, and set it up there again. This translates into a sensational forming-time of only 0.34 h/m². 4 complete sets of formwork are needed here, totalling 2500 m² in area. On the pre-stressed structures, the concept provides for the concreting to be carried out in uninterrupted pours. Here again, 4 sets of formwork are being used for this, with a combined area of 6600 m². The deck-slab formwork elements on the M51’s biggest bridges are being shored with more than 5700 m³ of Staxo 100. The wing walls, and the cantilevers on the wing walls, are then cast in a further pouring cycle. The formwork planning took account of the varying dimensions of the structures right from the outset. 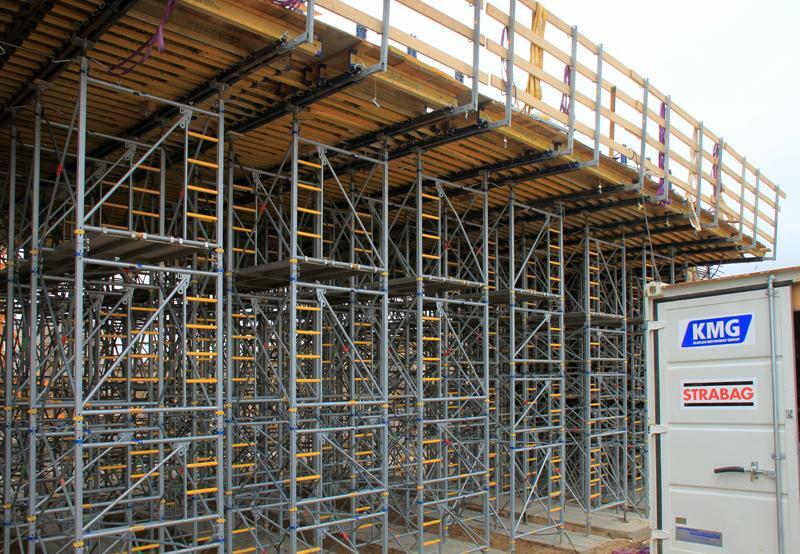 This has proven to be a huge advantage in the field, as it has reduced the modifications needed to an absolute minimum – a seamless A-Z formwork concept, then, for the very best results. To allow for the varying geometries, several of the up to 5 m high vertically stackable formwork elements are also designed for radii of 3 m. Here in Denmark, Doka 3-SO sheets have been chosen as the form-ply, faced with rough-cut tongue-and-groove boards in the visibly exposed zones and with planed ones on the parapets. At peak times, there are some 130 professionals working concurrently on 13 of the structures in this project. Over the course of the 16-month construction period, some 28,500 m³ of concrete and 2920 t of reinforcement steel have to be correctly placed. 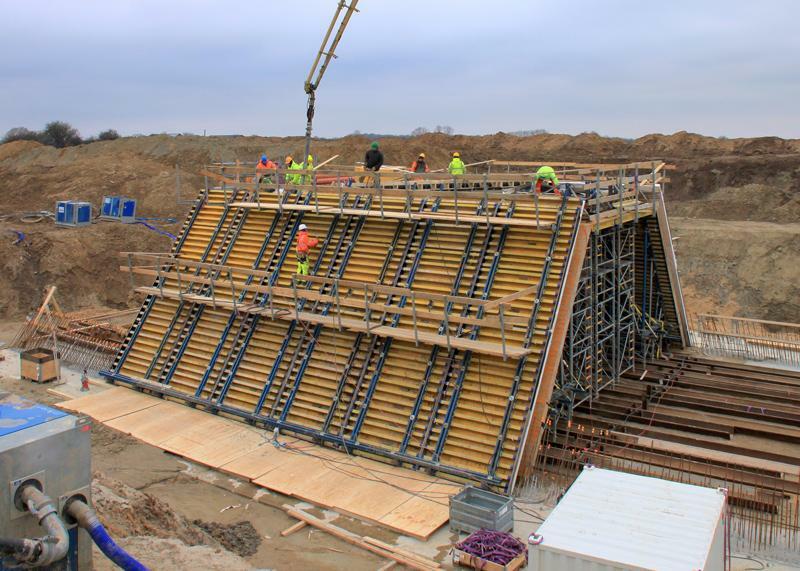 As a pathbreaking formwork manufacturer, Doka takes an all-encompassing view of the construction sequence. This is why its spectrum of services includes not only the formwork planning and statical calculations but also the basic assembly and subsequent onsite return and dismantling of the rented formwork. With ongoing site service from experienced Doka project engineers and skilled Formwork Instructors, construction firms are given optimum support. “These were the points that were particularly important to us, which is why we awarded the whole formwork contract to Doka”, says Project Superintendent Torben Brokop. Thank you for your interest - Bridge-building in record time. Thank you very much for your interest - Bridge-building in record time.